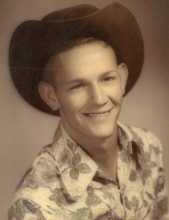 Robert “Bob” Daniel Mickler, 86, of Rule, passed away Sunday, April 7, 2019 in Stamford, TX. A funeral service will be held at 10 am, Thursday, April 11, 2019 at Paint Creek Baptist Church with Pastor Cory Cochran officiating. Burial will follow under the direction of Haskell Funeral Home. A visitation will be held Wednesday from 6 – 8 pm at the funeral home, 2 Avenue D. Condolences may be made at www.haskellfuneralhometx.com. Bob was born July 7, 1932 in Stamford, Texas, the son of Jesse James Mickler and Lillian Leona Ross Mickler. He attended Paint Creek Schools, later graduating from Abilene Christian High School. On April 29, 1955, he married Rosemary Rice in Big Spring, TX. She preceded him in death June 22, 1998. On December 14, 2005, he married Tammy Goad in Haskell, TX. His passion was ranching, which he did all his life. In his early years, he was a softball pitcher. Bob enjoyed singing and leading the music at church. He enjoyed playing golf. He was preceded in death by his parents, wife, Rosemary Rice Mickler, and brother, James Ross Mickler. Bob is survived by his wife Tammy Mickler of Rule, TX; daughter, Melyn Wittenborn and husband James of Haskell, TX; daughter, Dannette Smith of Haskell, TX; son, Rob Mickler and wife Corrie of Richards, TX; step-son, Eric Hobbs and wife Anna of Raleigh, NC; step-son, Christopher Hobbs and wife Diana of The Woodlands, TX; step-daughter, Heather Tank and husband Phillip of San Diego, CA; grandchildren, Brandie Anderson and husband Justin of Abilene, TX; Ross Wittenborn of Palacios, TX; Krysta Winegeart of Abilene, TX; Myles Mickler of Richards, TX; Titus Tank, Miriam Tank both of San Diego, CA; David Hobbs of The Woodlands, TX; Emiliya Hobbs and Lilliana Hobbs both of Raleigh, NC. He is also survived by sister, Sudy Williams of Stephenville, TX; brother, Twain Mickler of Haskell, TX, numerous nieces, nephews and a host of dear friends. To send flowers or a remembrance gift to the family of Robert "Bob" Daniel Mickler, please visit our Tribute Store. "Email Address" would like to share the life celebration of Robert "Bob" Daniel Mickler. Click on the "link" to go to share a favorite memory or leave a condolence message for the family.